A savory, low calorie, Mexican snack for only 98 calories for 2 pepper halves! (4 SP) Delicious warm or cold and super easy to make! In a large mixing bowl, mix together cream cheese, cheddar cheese and taco seasoning until fully blended. Stuff each pepper with a small amount of cheese mixture, until level with the top of each pepper. In a separate, small, microwaveable, bowl, melt butter then mix in panko breadcrumbs. Dip each pepper half into the breadcrumb mixture and press down to adhere. 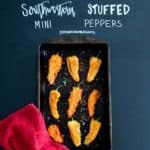 Place peppers onto a foil lined baking sheet. Bake for 15 minutes then switch oven to broil. Broil for 2-3 minutes, until browned. Watch closely to prevent burning. Allow to cool then serve! Leftovers can be microwaved for about 45 seconds.